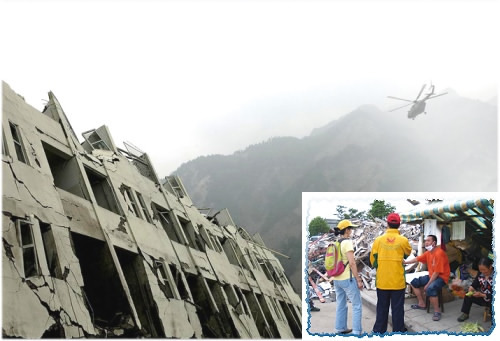 The devastating earthquake that occurred on May 12, 2008 in Wenchuan County, Sichuan Province of mainland China caused severe damage in Sichuan and neighboring provinces and as many as 46 million casualties. Master, deeply concerned about the situation, immediately contributed US$50,000 and instructed our Association members to render relief. Fellow initiates worldwide also generously offered financial support, and medical professionals among Hong Kong fellow initiates joined in the work. Master’s unconditional love and fellow initiates’ caring actions helped countless disaster victims of Sichuan, Gansu and Shannxi Provinces. On May 13, within ten hours of the earthquake, our Sichuan fellow initiates were already in action, purchasing relief materials and reaching the heavily hit areas of Pengzhou. Our initiates from Hong Kong and other regions also arrived to assist. Destroyed roads in the disaster area plus continuous aftershocks and frequent landslides caused great difficulties for the relief work. Braving the dangers that may occur at any time, the initiates still brought truckloads of relief supplies filled with Master’s love to the relief army and temporary shelters for displaced people. From May 13 to mid-June, they delivered urgently needed food, cotton quilts, tents, canvas tarpaulins, clothes, shoes, sanitation items, cooking utensils and urgently needed medicines. Apart from bringing relief supplies to the frontline affected areas, initiates also went in groups to hospitals, providing vegetarian meals, clothes and daily necessities for the wounded and sick there. On June 1, International Children’s Day, Master’s deep love and care brought joy amidst this devastation to the children in orphanages and “tent schools” in Mianyang and Qingchuan with gifts of cookies and stationary. These schools were also provided with academic supplies, books, computers and electric fans. And, upon hearing that teachers suffered from rheumatism and arthritis due to sleeping on the damp ground, the initiates immediately purchased folding beds for all of them. They were deeply touched. Since June, our Association’s relief team shifted their focus to reconstruction work, and assisting orphans and the elderly by supplying them with additional funds. In Gansu, access to the disaster areas was prohibited, so the urgently needed tents and water-proof cushions were sent to the Civil Administration Bureau for distribution. 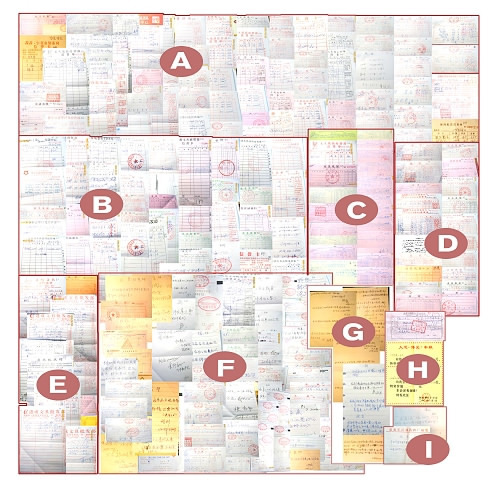 Shannxi initiates’ loving, generous contributions were quickly sent to the local Red Cross and China Charity Federation to be delivered by them to those affected by the disaster. Our Association’s disaster relief work is still on going. During this time, initiates deeply felt that love is the most important bridge for human communication. Everyone was touched by the harmonious, caring, tireless efforts of all government officials, soldiers and people from all over China and the world, as well as the financial assistance that brought great comfort both physically and spiritually to the disaster victims - truly a manifestation of God’s divine love! Monetary contribution to the Red Cross and the China Charity Federation. Note 1: Throughout the relief operation, fellow initiates paid for their own transportation, food and accommodation expenses. Note 2: Any surplus relief fund will be used for post-disaster rebuilding work and other disaster relief in China. From late May to mid June this year, heavy rain caused severe floods to a vast region in southern China, affecting tens of millions of people in more than twenty provinces. Our Association members, upon receiving Master’s instructions, immediately assessed the situation and went to the areas that were the most seriously affected, which were Hu Nan, Gui Zhou and Guang Xi provinces, to render relief. Much needed rice, cooking oil, quilts, buckets, thermo flasks and basins were bought and distributed to the victims in Qing Lang Township, Yuan Ling County, Hu Nan Province. Relief cash was also given to those who needed extra help. 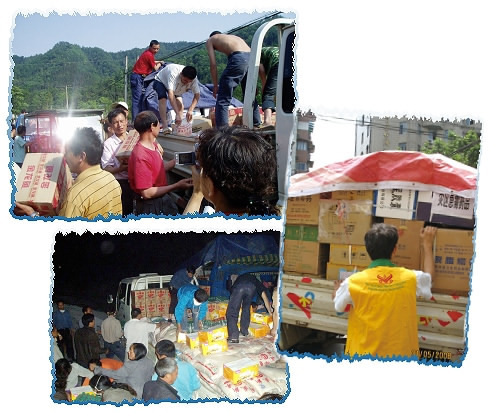 To victims in the Xin Tun, Le Tun and Da Yi regions of Mang Mo County, Gui Zhou Province, rice, salt, noodles, quilts and other relief items were provided. A hundred sets of “New Age Diet Seminar” DVDs were given to the local civil affairs officials and victims. In Gui Lin City of Guang Xi Province, rice and oil were brought to the victims in Yong Fu Town, and mineral water and biscuits to those in Long Tou Township. In addition to the flood, more than ten townships in Li County of Hu Nan Province were also devastated by a tornado and hail. 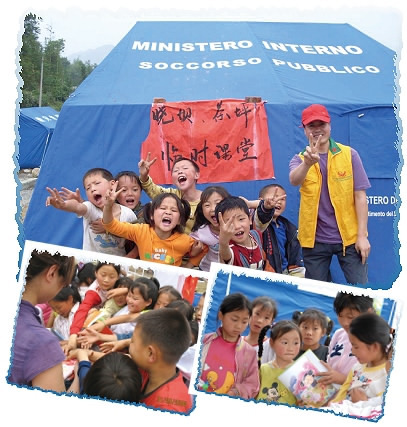 After contacting the local civil affairs department, the initiates decided to carry out the relief work in Jin Lo, the most disaster stricken town. The civil affairs officials said the victims were not short of food, but they were badly in need of fertilizer as they were trying to grow other kinds of crops. Ten tons of urea fertilizer was then purchased for the victims in Jin Lo, and relief cash was also distributed to those whose houses were damaged. The pure-hearted villagers expressed their deep gratitude; some were even moved to tears. The initiates are very grateful for Master’s blessing. While extending love to others through the relief work, they have come to experience what is the true love of this world. Note: Throughout the relief operation, fellow initiates paid for their own transportation, food and accommodation expenses.